Yes, Paintball is one of the safest sports out there. If the most important rule is obeyed (never remove your mask during the game), possible injuries are reduced to a minor scratch or twist. The other rule we emphasize is: as long as you’re not playing, keep your pacifier and safety button on. What is the minimum number of people to play? The minimum number of people must be 8. If you are less let us know to include you in our list of open games, and thus help you form a group to enjoy a great game of Paintball in Madrid. 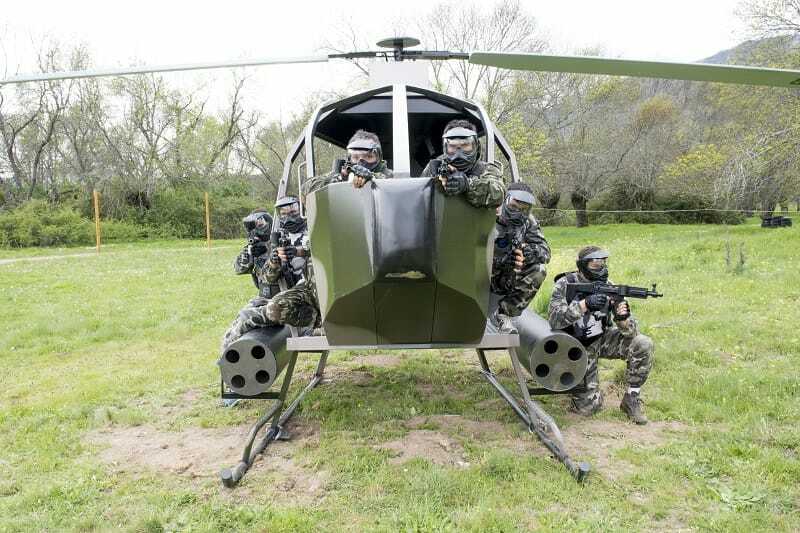 -Anyone over the age of 18 can play at Gran Paintball Madrid. -Boys and girls between 14 and 18 years old must come with a valid ID and a paternal authorization. -Boys and girls between 8 and 13 years old will play a special kind of Paintball with equipment specifically adapted for them. They must bring parental authorization. We encourage everyone to come and have a rush of adrenaline by doing a sporting activity in a completely natural environment. Paintball in Madrid is ideal for companies, bachelor parties, multi-adventure activities in Madrid, or simply to enjoy a fun day, original and, above all, different. In Gran Paintball Madrid the time limit is 3 hours from the time you are quoted; our experience tells us that it is plenty of time to use up to 1000 balls. Most paintball fields let you play for 90 minutes, but we want you to enjoy the experience without rushing and savouring all the possible scenarios. We only ask you to be punctual so that all the games run smoothly. From there the only limitations will be your energies and the minimum necessary visibility. What days can you play? You can play any day of the year as long as you book well in advance. Between 9:00 a.m. and 23:00 p.m. we completely adapt to your needs. You choose the time of day that best suits you, and we will make sure you have an unforgettable day in the best Paintball fields. We recommend that you wear comfortable clothes and sports shoes or mountain shoes. Paintball is a sport in which you will not stop running, hiding and dragging to surprise your rivals and win the game! Will my clothes get stained with paint? No, in Gran Paintball Madrid we give you the best equipment on the market, and these include integral camouflage suits that even cover the neck. Even so, the paint used is completely biodegradable and comes out simply by cleansing it with a little water. Can you play Paintball if it rains or it’s cold? You can play if it rains, although we don’t recommend it. That’s why we are one of the few fields that if it rains, we invite you to change the game to another day (other fields force you to play with raincoats). The reason is that although it is possible to play, it is not enjoyed the same, the masks fog up, and the experience is not so good. We think it’s better to play another day and really enjoy the experience. Regarding the cold, when you play Paintball we assure you that you will get warm very fast. In fact many of the best games that are played in winter, even with snow, which is hilarious. You’ll also wear your own clothes, and our camouflage suits. What do I have to do to book? All you have to do is call us on 636 47 53 05 or send us an email to info@granpaintballmadrid.es and we will look for the timetable and the offer that best suits you. You can also send us a WhatsApp telling us that you want to book or that you want information, and we’ll call you. It couldn’t be easier! The most common games consist of dividing participants into two teams and assigning them missions or different challenges. 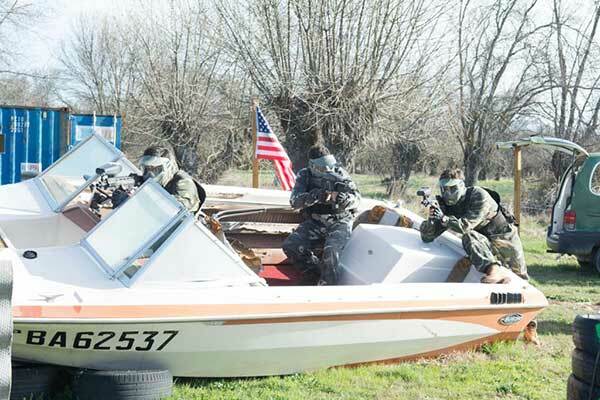 However, in our Paintball fields in Madrid, we stand out for having revolutionized the world of Paintball with completely unique and original games that will make your experience even more real, authentic and unforgettable. How many balls will I use? Although this depends a lot on the person and the strategy that each one adopts, the normal thing is to use between 200-400 balls to enjoy the game to the maximum. Precisely for this reason, we recommend that you look at our Offers section, or that you ask us for a completely personalized budget; in this way you will play the best game of your life, at the lowest possible price. Guaranteed! We recommend that you visit the section “Prices and Offers” to find the promotion that best suits your group. Access to Gran Paintball Madrid is very easy and very direct. If you are coming from Madrid city take the A-6 (it has 4 lanes) and take exit 47 towards El Escorial. Exactly at kilometre point number 5 of the M-600, on the left hand side, you will find the entrance. If you prefer to come by public transport, the 664 bus that leaves from Moncloa drops you off exactly at the door of the Paintball, and takes 35 minutes. All you have to do is tell the driver to drop you off at the Urbanization La Pizarra stop. If you want the schedules, you only have to ask us with a WhatsApp, call or email. We encourage you to visit our section “How to get there” to see how easy it is to access our Paintball fields from anywhere. When is a player eliminated? When you receive a direct impact, both on the person and on any object it carries, or when the mask is removed during a game (remember, you must never break this rule!). What kind of markers do you have? In Gran Paintball Madrid we have the best markers offered by any field in Madrid. This is what many Paintball say, but in our case it is true. We give you competition equipment, with semi-automatic markers (every time you pull the trigger a ball comes out) BRAVO ONE TACTICAL, real replicas of the M16, as well as electronic markers Tippmann X7 PHENOM, with air compressed system integrated into the belt. Inform yourself and you will see the great difference between these markers and the typical Inferno, Tippmann 98, etc. offered by other Paintball fields or multi-adventure companies in Madrid. Can you wear glasses with a mask? Yes, our masks are designed so that you can wear any type of glasses underneath. How far do the balls go? Do they hurt? The balls can reach a distance of approximately 60 meters. If you shoot at very short distances (less than 6 meters), they may hurt a little, like when you get a pinch. That’s why our instructors will always make sure that the rules are respected at all times and nothing prevents you from enjoying this great experience. What happens if the event is cancelled and we have paid the reservation fee? In case of cancellation by the customer, giving us at least a 48 hours notice, or by decision of Gran Paintball Madrid due to weather conditions, the game will be postponed to any other day the client decides within the period of 1 year (on a date that suits the customer and Gran Paintball Madrid). The signal will not be susceptible of return in any case, since you must bear in mind that once you have reserved, we reject many games of people who later want to reserve at that hour. Remember that we never force you to play with rain, so if it rains the day of your game of Paintball, you have a year to play without losing the reservation fee. How many fields do you have? 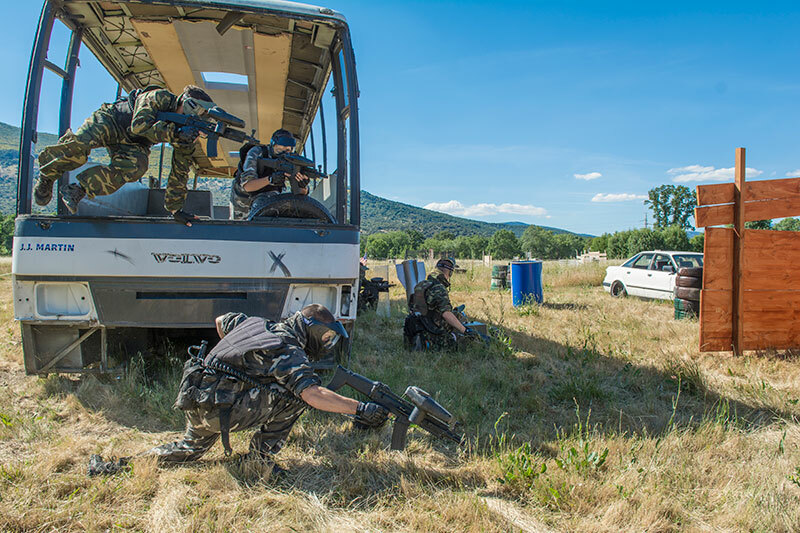 In Gran Paintball Madrid we currently have 9 huge fields (one of them is the largest field in Spain, with more than 2 hectares -no multi-adventure company Madrid has a forest scene so extensive where we play such huge battles-). Plus we’re building two more. We have 150,000 m2 of land with forests, mountains and lagoons. Do you have any kind of insurance inside the facility? Yes, we have two insurances: civil liability insurance, and accident insurance, which acts as a complement to the previous one and covers the participants in case of any eventuality.